I’ve been wanting to try my hand at making a Japanese breakfast for a while now, ever since getting a book called, “Japanese Women Don’t get Fat or Old.” Apart from the title, which cracked me up because it’s a snarky take-off on the bestseller “French Women Don’t get Fat,” I got the book because I love Japanese food and figure that since millions of Japanese women cook this stuff at home, why can’t I? I also have been wanting to eat better in general, as part of my ongoing midlife crisis overhaul. Be present. Be content. Stop smoking. Cut down on sugar. Eat better. Practice your inversions. Eat better. Last time I had a Japanese breakfast I was, not surprisingly, in Japan. We all went to Kobe to attend the nuptials of my brother David to the fabulous Hiromi-chan. The hotel we stayed in offered a choice of buffet-style eating in the a.m. – Western Style or Japanese. I realized long ago, on one of my first trips to Japan, that it’s best to live by the When in Rome credo when it comes to eating. Why would I want the Japanese approximation of a western breakfast (which always included runny scrambled eggs, the whitest of white bread toast, wrong hash browns and a refreshing, space-aged glass of Tang,) when I could revel in what the Japanese do best – which is delightfully presented portions of fresh fish, pickled vegetable, aromatic green tea and a steaming bowl of rice. I suppose this doesn’t appeal to everyone. But to me it’s a no brainer. Naturally I’ll eat a Japanese breakfast any chance I get. It sates, but doesn’t fill you up. There’s no sugar high so there’s no corresponding sugar crash. And you don’t get hungry for a long time. There are a lot of upsides to eating more Japanese, not the least of which are that it’s healthier than my default bagel and blended mocha. It’s healthier. I’d feel better. My daughter would eat a Japanese breakfast. If I were the sort of mother who could get up 30 minutes before she does to cook it for her, I’m sure she’d appreciate it. This would be hard because I’m not that kind of mother, and Annie is an early bird, rising on her own at 6 or so every morning no matter how little sleep she’s had. But there’s no reason I can’t do a practice run in the middle of the day when she’s at school and I should be writing. Tony says he’d love to eat more Japanese because it doesn’t upset his stomach. I could make him a Japanese breakfast, but honestly, I think he’s more talk than action. Seaweed and miso? He’d punk out, I know it. But then he can be goaded into trying new things. I made him eat an octopus tentacle at Asenabo in Studio City the other night. Not a tentacle,exactly, but a suction cup, to be precise. A tiny little white teacup with purple rim. 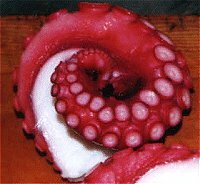 Raw octopus. I asked the sushi chef, the one who looks just like my flamenco teacher, to make me what he wanted, because I’ve read somewhere that that’s what you’re supposed to do at a sushi restaurant and it makes the chef happy, and plus I wanted to prove that I’m no wimp, I can consume sushi like a pro. And I prayed he wouldn’t serve uni, which is sea urchin, and which was once described to me as tasting like rancid mustard that had been sitting in a bucket of sea water for a week. And fortunately, he didn’t. But he did give me octopus, which I’ve had in the past, and which I know to be very chewy but otherwise fairly tasteless, and so I’m game to put the item in my mouth. Tony, though. Another matter. Although born and raised in Los Angeles, he’d only been hipped to sushi a few years ago, and is a man who likes to play it safe and close to his chest. So I did what you have to do with Spanish men. I played on his machismo. He looked at me sideways like he does and I knew I had him. Glowering at me, he opened his mouth and took the little cup from my chopstick. He chewed once. Swallowed. Man. He could stop a bull with that look. He muttered an obscenity in Spanish. Something about my mother. 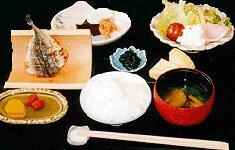 My Japanese breakfast would be basic and traditional. Rice, miso soup, some nori (seaweed) slices and a bit of grilled fish. I'd have to forgoe the delicious pickled bits for now. There's a way to make them yourself but that's not something a bad home cook should attempt on her own. I wanted to approximate the kind of breakfast I enjoyed in Japan. The sort of repast first introduced to me on my first trip there, lo these many moons ago when I was but a lass of 16. Miso soup is the staple item around which everything else in the breakfast is wrapped. The Japanese drink it every day for breakfast. I’d like to do the same, but that means I have to learn how to make it easily by myself. I’m a bit of a snob when it comes to food – I vastly prefer making my own to opening a packet and adding water. Even though adding water is a damn sight more certain to turn out in my kitchen, I insist on learning how to make basic items myself. Until I do, I don’t make it in the morning for anybody. Three tablespoons (rough) low-sodium miso. I think it’s red. My mother-in-law is a rebirther in London and is the kind of tidy, exacting woman I long to be. When she makes her miso soup, she always ads a concoction of kudzu (arrowroot) dissolved in cold water to “hold” the soup, and her soup, I must add, always turns out well. Soup I made without this step once turned out too watery. After I dissolve the miso in the water, I add the kudzu concoction. I added the bonito flakes when I realized I should have made dashi and used that instead of water to give it the proper flavor. But after simmering for 5 or 10 minutes I decided I should strain the bonito flakes out of the liquid. This I did using cheesecloth because I couldn’t find my big strainer. Always wanted to use cheesecloth for straining. I mean, I have the cheesecloth in my knife drawer, just in case I should get ambitious and try to cook something that requires my using cheesecloth for some aspect of the preparation. So I decided to use it for this. But in typical fashion, I bollixed it all up. I cut the cheesecloth wrong and didn’t get enough of it to cover the bowl. I cut another swatch and the whole things tumbled from my hands to the floor, unraveling as it went. I wasn’t able to pull the cloth taut across the bowl, so when I poured in the soup the bonito flakes, which now strongly resembled something a child pukes up on her pillow at 3 a.m., burbled out and down and largely back into the soup. There was a lot of dripping as well. I could feel the eyes of a thousand old Japanese Okasan spirits watching me with bemused disgust. I know the making of this soup should be serene and as easy as making tea. I didn’t think this was the way it was supposed to work, yet here I was in the middle of it, so I had to stay the course. I eventually strained out most of the bonito flakes, and put the liquid back into the pot. I cut the scallions. I cubed tofu. More or less. I bought little salmon fillets at Marukai, but I don’t have a grill. Note to self: get off the stick and buy one of those clever iron grills I can set on the stove top. So I spray an iron skillet with canola oil, heat it up, and quick fry the salmon. Rice. I can actually make rice. For someone who makes the most embarrassing mistakes in the kitchen, I have an uncanny knack for the perfect pot of rice. I use the Japanese style rice today – 1 and ½ cups to 2 cups water, bring to a boil, lower heat, cover, and simmer for 20 minutes. The results? It took almost an hour to make this meal. Too long to do realistically in the cramped morning hour, when I’m trying to bomb my little boy out of bed, monitor what my daughter is trying to wear to school (“It’s cold! Put on long pants!) and get a little something called food into me. But I suspect I could streamline the production enough to pull it off one day. Will I? Nah. The miso soup turned out surprisingly decent but still, not *quite* right. I did drink the whole bowl, which was a vast improvement over my last attempt, which was so salty I took one sip and threw the rest down the drain. The gold standard test was Annie’s eating a bowl of it that afternoon. You can’t sneak bad-tasting miso past a 9-year-old. I’ll say it was a qualified success. Next time I’ll make some dashi and try it with that as the base stock. I’ve got some daikon rotting in my vegetable crisper as we speak. The salmon didn’t taste like it did in the hotel in Japan, not surprisingly, but it was ok. It tasted like …salmon. It’s very hard to mess up salmon, although I’ve been known to do so, usually by woefully overcooking it. Maybe there were some seasonings involved that I don’t know about. It would help to have that grill. My nori was stale. Damnit. That’s what happens when you take out that little packet of freshener so the five-year-old won’t steal it and put it in his bath. I can’t seem to keep my seaweed stashes fresh. The rice was fine. The green tea, (gen-mai cha – green tea and brown rice) was perfect, although it’s tedious to clean out my old silver tea pot and it makes ensuing cups of tea (of the non-green sort) taste like green tea. Oh well. A small price to pay. I’ll fine-tune all of this on another date. Stay tuned.